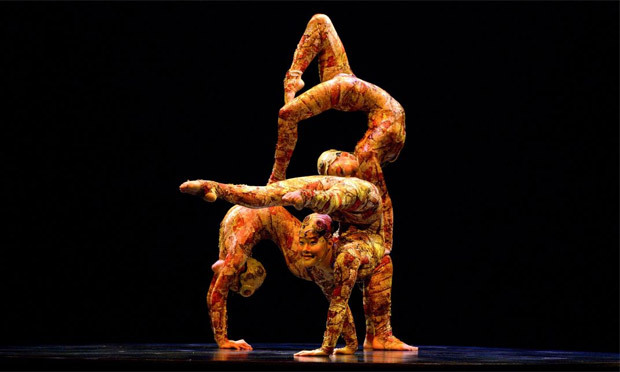 NeuroChangers | The Cirque du Soleil for spinal cord implants. The Cirque du Soleil for spinal cord implants. 30 Jan The Cirque du Soleil for spinal cord implants. Cirque du Soleil is a Canadian based performance of strong, FLEXIBLE, dancers and performers that showcase magical entertainment. Although there are many different stories for each show, the main thing that captivates the crowd is often the strength and flexibility of the performers. It’s almost surreal to see some of the positions the body can contort to. I recently came across this article that discusses a new flexible spinal cord implant which may one day help people who are paralyzed to walk again. Although the general population may not be as flexible as the performers of Cirque de Soleil, our muscles, tissues and joints bend in many different ways. When implanting a foreign object into the tissues, it must be able to move with it! In the past, there has been technology similar to the idea of the e-Dura; however, they were less natural due to the stiff immobile gadgets which tend to cause damage or inflammation to the nervous tissue over time. The e-Dura implants are not yet being used in human research; however, they have been used on rats which has shown increased mobility and durability by not causing friction and damage to the tissues. Swiss researchers are very excited to have created this flexible implant and look forward to trying it on humans in the near future. Click this link below to see more.